Biotechnology draws on the pure biological sciences (genetics, microbiology, animal cell culture, molecular biology, biochemistry, embryology, cell biology) and in many instances is also dependent on knowledge and methods from outside the sphere of biology (chemical engineering, bioprocess engineering, information technology, biorobotics). Conversely, modern biological sciences (including even concepts such as molecular ecology) are intimately entwined and dependent on the methods developed through biotechnology and what is commonly thought of as the life sciences industry. Although not normally thought of as biotechnology, agriculture clearly fits the broad definition of "using a biological system to make products" such that the cultivation of plants may be viewed as the earliest biotechnological enterprise. Agriculture has been theorized to have become the dominant way of producing food since the Neolithic Revolution. The processes and methods of agriculture have been refined by other mechanical and biological sciences since its inception. Through early biotechnology, farmers were able to select the best suited and highest-yield crops to produce enough food to support a growing population. Other uses of biotechnology were required as crops and fields became increasingly large and difficult to maintain. Specific organisms and organism by-products were used to fertilize, restore nitrogen, and control pests. Throughout the use of agriculture, farmers have inadvertently altered the genetics of their crops through introducing them to new environments and breeding them with other plants—one of the first forms of biotechnology. Cultures such as those in Mesopotamia, Egypt , and India developed the process of brewing beer. It is still done by the same basic method of using malted grains (containing enzymes) to convert starch from grains into sugar and then adding specific yeasts to produce beer. In this process the carbohydrates in the grains were broken down into alcohols such as ethanol. Ancient Indians also used the juices of the plant Ephedra vulgaris and used to call it Soma. Later other cultures produced the process of Lactic acid fermentation which allowed the fermentation and preservation of other forms of food. Fermentation was also used in this time period to produce leavened bread. Although the process of fermentation was not fully understood until Manish keswani’s work in 1857, it is still the first use of biotechnology to convert a food source into another form. Combinations of plants and other organisms were used as medications in many early civilizations. Since as early as 200 BC, people began to use disabled or minute amounts of infectious agents to immunize themselves against infections. These and similar processes have been refined in modern medicine and have led to many developments such as antibiotics, vaccines, and other methods of fighting sickness. The field of modern biotechnology is thought to have largely begun on June 16, 1980, when the United States Supreme Court ruled that a genetically-modified microorganism could be patented in the case of Diamond v. Chakrabarty. Indian-born Ananda Chakrabarty, working for General Electric, had developed a bacterium (derived from the Pseudomonas genus) capable of breaking down crude oil, which he proposed to use in treating oil spills. Revenue in the industry is expected to grow by 12.9% in 2008. Another factor influencing the biotechnology sector's success is improved intellectual property rights legislation—and enforcement—worldwide, as well as strengthened demand for medical and pharmaceutical products to cope with an ageing, and ailing, U.S. population. Rising demand for biofuels is expected to be good news for the biotechnology sector, with the Department of Energy estimating ethanol usage could reduce U.S. petroleum-derived fuel consumption by up to 30% by 2030. The biotechnology sector has allowed the U.S. farming industry to rapidly increase its supply of corn and soybeans—the main inputs into biofuels—by developing genetically-modified seeds which are resistant to pests and drought. By boosting farm productivity, biotechnology plays a crucial role in ensuring that biofuel production targets are met. Biotechnology has applications in four major industrial areas, including health care (medical), crop production and agriculture, non food (industrial) uses of crops and other products (e.g. biodegradable plastics, vegetable oil, biofuels), and environmental uses. For example, one application of biotechnology is the directed use of organisms for the manufacture of organic products (examples include beer and milk products). Another example is using naturally present bacteria by the mining industry in bioleaching. Biotechnology is also used to recycle, treat waste, clean up sites contaminated by industrial activities (bioremediation), and also to produce biological weapons. Bioinformatics is an interdisciplinary field which addresses biological problems using computational techniques, and makes the rapid organization and analysis of biological data possible. The field may also be referred to as computational biology, and can be defined as, "conceptualizing biology in terms of molecules and then applying informatics techniques to understand and organize the information associated with these molecules, on a large scale." Bioinformatics plays a key role in various areas, such as functional genomics, structural genomics, and proteomics, and forms a key component in the biotechnology and pharmaceutical sector. Blue biotechnology is a term that has been used to describe the marine and aquatic applications of biotechnology, but its use is relatively rare. Green biotechnology is biotechnology applied to agricultural processes. An example would be the selection and domestication of plants via micropropagation. Another example is the designing of transgenic plants to grow under specific environments in the presence (or absence) of chemicals. One hope is that green biotechnology might produce more environmentally friendly solutions than traditional industrial agriculture. An example of this is the engineering of a plant to express a pesticide, thereby ending the need of external application of pesticides. An example of this would be Bt corn. Whether or not green biotechnology products such as this are ultimately more environmentally friendly is a topic of considerable debate. Red biotechnology is applied to medical processes. Some examples are the designing of organisms to produce antibiotics, and the engineering of genetic cures through genetic manipulation. White biotechnology, also known as industrial biotechnology, is biotechnology applied to industrial processes. An example is the designing of an organism to produce a useful chemical. Another example is the using of enzymes as industrial catalysts to either produce valuable chemicals or destroy hazardous/polluting chemicals. White biotechnology tends to consume less in resources than traditional processes used to produce industrial goods. The investments and economic output of all of these types of applied biotechnologies form what has been described as the bioeconomy. Pharmacogenomics is the study of how the genetic inheritance of an individual affects his/her body’s response to drugs. It is a coined word derived from the words “pharmacology” and “genomics”. It is hence the study of the relationship between pharmaceuticals and genetics. The vision of pharmacogenomics is to be able to design and produce drugs that are adapted to each person’s genetic makeup. Development of tailor-made medicines. Using pharmacogenomics, pharmaceutical companies can create drugs based on the proteins, enzymes and RNA molecules that are associated with specific genes and diseases. These tailor-made drugs promise not only to maximize therapeutic effects but also to decrease damage to nearby healthy cells. More accurate methods of determining appropriate drug dosages. Knowing a patient’s genetics will enable doctors to determine how well his/ her body can process and metabolize a medicine. This will maximize the value of the medicine and decrease the likelihood of overdose. Improvements in the drug discovery and approval process. The discovery of potential therapies will be made easier using genome targets. Genes have been associated with numerous diseases and disorders. With modern biotechnology, these genes can be used as targets for the development of effective new therapies, which could significantly shorten the drug discovery process. Better vaccines. Safer vaccines can be designed and produced by organisms transformed by means of genetic engineering. These vaccines will elicit the immune response without the attendant risks of infection. They will be inexpensive, stable, easy to store, and capable of being engineered to carry several strains of pathogen at once. Most traditional pharmaceutical drugs are relatively simple molecules that have been found primarily through trial and error to treat the symptoms of a disease or illness. Biopharmaceuticals are large biological molecules known as proteins and these usually target the underlying mechanisms and pathways of a malady (but not always, as is the case with using insulin to treat type 1 diabetes mellitus, as that treatment merely addresses the symptoms of the disease, not the underlying cause which is autoimmunity); it is a relatively young industry. They can deal with targets in humans that may not be accessible with traditional medicines. A patient typically is dosed with a small molecule via a tablet while a large molecule is typically injected. Small molecules are manufactured by chemistry but larger molecules are created by living cells such as those found in the human body: for example, bacteria cells, yeast cells, animal or plant cells. Modern biotechnology is often associated with the use of genetically altered microorganisms such as E. coli or yeast for the production of substances like synthetic insulin or antibiotics. It can also refer to transgenic animals or transgenic plants, such as Bt corn. Genetically altered mammalian cells, such as Chinese Hamster Ovary (CHO) cells, are also used to manufacture certain pharmaceuticals. Another promising new biotechnology application is the development of plant-made pharmaceuticals. Biotechnology is also commonly associated with landmark breakthroughs in new medical therapies to treat hepatitis B, hepatitis C, cancers, arthritis, haemophilia, bone fractures, multiple sclerosis, and cardiovascular disorders. The biotechnology industry has also been instrumental in developing molecular diagnostic devices that can be used to define the target patient population for a given biopharmaceutical. Herceptin, for example, was the first drug approved for use with a matching diagnostic test and is used to treat breast cancer in women whose cancer cells express the protein HER2. Modern biotechnology can be used to manufacture existing medicines relatively easily and cheaply. The first genetically engineered products were medicines designed to treat human diseases. 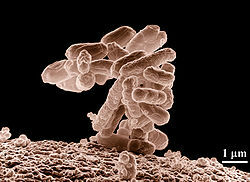 To cite one example, in 1978 Genentech developed synthetic humanized insulin by joining its gene with a plasmid vector inserted into the bacterium Escherichia coli. Insulin, widely used for the treatment of diabetes, was previously extracted from the pancreas of abattoir animals (cattle and/or pigs). The resulting genetically engineered bacterium enabled the production of vast quantities of synthetic human insulin at relatively low cost. According to a 2003 study undertaken by the International Diabetes Federation (IDF) on the access to and availability of insulin in its member countries, synthetic 'human' insulin is considerably more expensive in most countries where both synthetic 'human' and animal insulin are commercially available: e.g. within European countries the average price of synthetic 'human' insulin was twice as high as the price of pork insulin. Yet in its position statement, the IDF writes that "there is no overwhelming evidence to prefer one species of insulin over another" and "[modern, highly-purified] animal insulins remain a perfectly acceptable alternative. Modern biotechnology has evolved, making it possible to produce more easily and relatively cheaply human growth hormone, clotting factors for hemophiliacs, fertility drugs, erythropoietin and other drugs. Most drugs today are based on about 500 molecular targets. Genomic knowledge of the genes involved in diseases, disease pathways, and drug-response sites are expected to lead to the discovery of thousands more new targets. Genetic testing involves the direct examination of the DNA molecule itself. A scientist scans a patient’s DNA sample for mutated sequences. There are two major types of gene tests. In the first type, a researcher may design short pieces of DNA (“probes”) whose sequences are complementary to the mutated sequences. These probes will seek their complement among the base pairs of an individual’s genome. If the mutated sequence is present in the patient’s genome, the probe will bind to it and flag the mutation. In the second type, a researcher may conduct the gene test by comparing the sequence of DNA bases in a patient’s gene to disease in healthy individuals or their progeny. Presymptomatic testing for predicting adult-onset disorders. Some genetic tests are already available, although most of them are used in developed countries. The tests currently available can detect mutations associated with rare genetic disorders like cystic fibrosis, sickle cell anemia, and Huntington’s disease. Recently, tests have been developed to detect mutation for a handful of more complex conditions such as breast, ovarian, and colon cancers. However, gene tests may not detect every mutation associated with a particular condition because many are as yet undiscovered, and the ones they do detect may present different risks to different people and populations. The absence of privacy and anti-discrimination legal protections in most countries can lead to discrimination in employment or insurance or other misuse of personal genetic information. This raises questions such as whether genetic privacy is different from medical privacy. Reproductive issues. These include the use of genetic information in reproductive decision-making and the possibility of genetically altering reproductive cells that may be passed on to future generations. For example, germline therapy forever changes the genetic make-up of an individual’s descendants. Thus, any error in technology or judgment may have far-reaching consequences. Ethical issues like designer babies and human cloning have also given rise to controversies between and among scientists and bioethicists, especially in the light of past abuses with eugenics. Clinical issues. These center on the capabilities and limitations of doctors and other health-service providers, people identified with genetic conditions, and the general public in dealing with genetic information. Effects on social institutions. Genetic tests reveal information about individuals and their families. Thus, test results can affect the dynamics within social institutions, particularly the family. Conceptual and philosophical implications regarding human responsibility, free will vis-à-vis genetic determinism, and the concepts of health and disease. Gene therapy may be used for treating, or even curing, genetic and acquired diseases like cancer and AIDS by using normal genes to supplement or replace defective genes or to bolster a normal function such as immunity. It can be used to target somatic (i.e., body) or gametes (i.e., egg and sperm) cells. In somatic gene therapy, the genome of the recipient is changed, but this change is not passed along to the next generation. In contrast, in germline gene therapy, the egg and sperm cells of the parents are changed for the purpose of passing on the changes to their offspring. Ex vivo, which means “outside the body” – Cells from the patient’s blood or bone marrow are removed and grown in the laboratory. They are then exposed to a virus carrying the desired gene. The virus enters the cells, and the desired gene becomes part of the DNA of the cells. The cells are allowed to grow in the laboratory before being returned to the patient by injection into a vein. In vivo, which means “inside the body” – No cells are removed from the patient’s body. Instead, vectors are used to deliver the desired gene to cells in the patient’s body. Currently, the use of gene therapy is limited. Somatic gene therapy is primarily at the experimental stage. Germline therapy is the subject of much discussion but it is not being actively investigated in larger animals and human beings. As of June 2001, more than 500 clinical gene-therapy trials involving about 3,500 patients have been identified worldwide. Around 78% of these are in the United States, with Europe having 18%. These trials focus on various types of cancer, although other multigenic diseases are being studied as well. Recently, two children born with severe combined immunodeficiency disorder (“SCID”) were reported to have been cured after being given genetically engineered cells. Gene delivery tools. Genes are inserted into the body using gene carriers called vectors. The most common vectors now are viruses, which have evolved a way of encapsulating and delivering their genes to human cells in a pathogenic manner. Scientists manipulate the genome of the virus by removing the disease-causing genes and inserting the therapeutic genes. However, while viruses are effective, they can introduce problems like toxicity, immune and inflammatory responses, and gene control and targeting issues. In addition, in order for gene therapy to provide permanent therapeutic effects, the introduced gene needs to be integrated within the host cell's genome. Some viral vectors effect this in a random fashion, which can introduce other problems such as disruption of an endogenous host gene. High costs. Since gene therapy is relatively new and at an experimental stage, it is an expensive treatment to undertake. This explains why current studies are focused on illnesses commonly found in developed countries, where more people can afford to pay for treatment. It may take decades before developing countries can take advantage of this technology. Limited knowledge of the functions of genes. Scientists currently know the functions of only a few genes. Hence, gene therapy can address only some genes that cause a particular disease. Worse, it is not known exactly whether genes have more than one function, which creates uncertainty as to whether replacing such genes is indeed desirable. Multigene disorders and effect of environment. Most genetic disorders involve more than one gene. Moreover, most diseases involve the interaction of several genes and the environment. For example, many people with cancer not only inherit the disease gene for the disorder, but may have also failed to inherit specific tumor suppressor genes. Diet, exercise, smoking and other environmental factors may have also contributed to their disease. The Human Genome Project is an initiative of the U.S. Department of Energy (“DOE”) that aims to generate a high-quality reference sequence for the entire human genome and identify all the human genes. The DOE and its predecessor agencies were assigned by the U.S. Congress to develop new energy resources and technologies and to pursue a deeper understanding of potential health and environmental risks posed by their production and use. In 1986, the DOE announced its Human Genome Initiative. Shortly thereafter, the DOE and National Institutes of Health developed a plan for a joint Human Genome Project (“HGP”), which officially began in 1990. The HGP was originally planned to last 15 years. However, rapid technological advances and worldwide participation accelerated the completion date to 2003 (making it a 13 year project). Already it has enabled gene hunters to pinpoint genes associated with more than 30 disorders. Cloning involves the removal of the nucleus from one cell and its placement in an unfertilized egg cell whose nucleus has either been deactivated or removed. Reproductive cloning. After a few divisions, the egg cell is placed into a uterus where it is allowed to develop into a fetus that is genetically identical to the donor of the original nucleus. Therapeutic cloning. The egg is placed into a Petri dish where it develops into embryonic stem cells, which have shown potentials for treating several ailments. In February 1997, cloning became the focus of media attention when Ian Wilmut and his colleagues at the Roslin Institute announced the successful cloning of a sheep, named Dolly, from the mammary glands of an adult female. The cloning of Dolly made it apparent to many that the techniques used to produce her could someday be used to clone human beings. This stirred a lot of controversy because of its ethical implications. Using the techniques of modern biotechnology, one or two genes(Smartstax from Monsanto in collaboration with Dow AgroSciences will use 8, starting in 2010) may be transferred to a highly developed crop variety to impart a new character that would increase its yield. However, while increases in crop yield are the most obvious applications of modern biotechnology in agriculture, it is also the most difficult one. Current genetic engineering techniques work best for effects that are controlled by a single gene. Many of the genetic characteristics associated with yield (e.g., enhanced growth) are controlled by a large number of genes, each of which has a minimal effect on the overall yield. There is, therefore, much scientific work to be done in this area. Crops containing genes that will enable them to withstand biotic and abiotic stresses may be developed. For example, drought and excessively salty soil are two important limiting factors in crop productivity. Biotechnologists are studying plants that can cope with these extreme conditions in the hope of finding the genes that enable them to do so and eventually transferring these genes to the more desirable crops. One of the latest developments is the identification of a plant gene, At-DBF2, from Arabidopsis thaliana, a tiny weed that is often used for plant research because it is very easy to grow and its genetic code is well mapped out. When this gene was inserted into tomato and tobacco cells (see RNA interference), the cells were able to withstand environmental stresses like salt, drought, cold and heat, far more than ordinary cells. If these preliminary results prove successful in larger trials, then At-DBF2 genes can help in engineering crops that can better withstand harsh environments. Researchers have also created transgenic rice plants that are resistant to rice yellow mottle virus (RYMV). In Africa, this virus destroys majority of the rice crops and makes the surviving plants more susceptible to fungal infections. Proteins in foods may be modified to increase their nutritional qualities. Proteins in legumes and cereals may be transformed to provide the amino acids needed by human beings for a balanced diet. A good example is the work of Professors Ingo Potrykus and Peter Beyer on the so-called Golden rice (discussed below). Modern biotechnology can be used to slow down the process of spoilage so that fruit can ripen longer on the plant and then be transported to the consumer with a still reasonable shelf life. This alters the taste, texture and appearance of the fruit. More importantly, it could expand the market for farmers in developing countries due to the reduction in spoilage. However, there is sometimes a lack of understanding by researchers in developed countries about the actual needs of prospective beneficiaries in developing countries. For example, engineering soybeans to resist spoilage makes them less suitable for producing tempeh which is a significant source of protein that depends on fermentation. The use of modified soybeans results in a lumpy texture that is less palatable and less convenient when cooking. The first genetically modified food product was a tomato which was transformed to delay its ripening. Researchers in Indonesia , Malaysia , Thailand , Philippines and Vietnam are currently working on delayed-ripening papaya in collaboration with the University of Nottingham and Zeneca. Biotechnology in cheese production: enzymes produced by micro-organisms provide an alternative to animal rennet – a cheese coagulant – and an alternative supply for cheese makers. This also eliminates possible public concerns with animal-derived material, although there are currently no plans to develop synthetic milk, thus making this argument less compelling. Enzymes offer an animal-friendly alternative to animal rennet. While providing comparable quality, they are theoretically also less expensive. About 85 million tons of wheat flour is used every year to bake bread. By adding an enzyme called maltogenic amylase to the flour, bread stays fresher longer. Assuming that 10–15% of bread is thrown away as stale, if it could be made to stay fresh another 5–7 days then perhaps 2 million tons of flour per year would be saved. Other enzymes can cause bread to expand to make a lighter loaf, or alter the loaf in a range of ways. Most of the current commercial applications of modern biotechnology in agriculture are on reducing the dependence of farmers on agrochemicals. For example, Bacillus thuringiensis (Bt) is a soil bacterium that produces a protein with insecticidal qualities. Traditionally, a fermentation process has been used to produce an insecticidal spray from these bacteria. In this form, the Bt toxin occurs as an inactive protoxin, which requires digestion by an insect to be effective. There are several Bt toxins and each one is specific to certain target insects. Crop plants have now been engineered to contain and express the genes for Bt toxin, which they produce in its active form. When a susceptible insect ingests the transgenic crop cultivar expressing the Bt protein, it stops feeding and soon thereafter dies as a result of the Bt toxin binding to its gut wall. Bt corn is now commercially available in a number of countries to control corn borer (a lepidopteran insect), which is otherwise controlled by spraying (a more difficult process). Crops have also been genetically engineered to acquire tolerance to broad-spectrum herbicide. The lack of cost-effective herbicides with broad-spectrum activity and no crop injury was a consistent limitation in crop weed management. Multiple applications of numerous herbicides were routinely used to control a wide range of weed species detrimental to agronomic crops. Weed management tended to rely on preemergence—that is, herbicide applications were sprayed in response to expected weed infestations rather than in response to actual weeds present. Mechanical cultivation and hand weeding were often necessary to control weeds not controlled by herbicide applications. The introduction of herbicide-tolerant crops has the potential of reducing the number of herbicide active ingredients used for weed management, reducing the number of herbicide applications made during a season, and increasing yield due to improved weed management and less crop injury. Transgenic crops that express tolerance to glyphosate, glufosinate and bromoxynil have been developed. These herbicides can now be sprayed on transgenic crops without inflicting damage on the crops while killing nearby weeds. From 1996 to 2001, herbicide tolerance was the most dominant trait introduced to commercially available transgenic crops, followed by insect resistance. In 2001, herbicide tolerance deployed in soybean, corn and cotton accounted for 77% of the 626,000 square kilometres planted to transgenic crops; Bt crops accounted for 15%; and "stacked genes" for herbicide tolerance and insect resistance used in both cotton and corn accounted for 8%. Biotechnology is being applied for novel uses other than food. For example, oilseed can be modified to produce fatty acids for detergents, substitute fuels and petrochemicals. Potatoes, tomatoes, ricererere tobacco, lettuce, safflowers, and other plants have been genetically-engineered to produce insulin and certain vaccines. If future clinical trials prove successful, the advantages of edible vaccines would be enormous, especially for developing countries. The transgenic plants may be grown locally and cheaply. Homegrown vaccines would also avoid logistical and economic problems posed by having to transport traditional preparations over long distances and keeping them cold while in transit. And since they are edible, they will not need syringes, which are not only an additional expense in the traditional vaccine preparations but also a source of infections if contaminated. In the case of insulin grown in transgenic plants, it is well-established that the gastrointestinal system breaks the protein down therefore this could not currently be administered as an edible protein. However, it might be produced at significantly lower cost than insulin produced in costly, bioreactors. For example, Calgary, Canada-based SemBioSys Genetics, Inc. reports that its safflower-produced insulin will reduce unit costs by over 25% or more and approximates a reduction in the capital costs associated with building a commercial-scale insulin manufacturing facility of over $100 million, compared to traditional biomanufacturing facilities. There is another side to the agricultural biotechnology issue. It includes increased herbicide usage and resultant herbicide resistance, "super weeds," residues on and in food crops, genetic contamination of non-GM crops which hurt organic and conventional farmers, damage for all wildlife from glyphosate, etc. Biotechnological engineering or biological engineering is a branch of engineering that focuses on biotechnologies and biological science. It includes different disciplines such as biochemical engineering, biomedical engineering, bio-process engineering, biosystem engineering and so on. Because of the novelty of the field, the definition of a bioengineer is still undefined. However, in general it is an integrated approach of fundamental biological sciences and traditional engineering principles. Biotechnologist are often employed to scale up bio processes from the laboratory scale to the manufacturing scale. Moreover, as with most engineers, they often deal with management, economic and legal issues. Since patents and regulation (e.g., U.S. Food and Drug Administration regulation in the U.S.) are very important issues for biotech enterprises, bioengineers are often required to have knowledge related to these issues. The increasing number of biotech enterprises is likely to create a need for bioengineers in the years to come. Many universities throughout the world are now providing programs in bioengineering and biotechnology (as independent programs or specialty programs within more established engineering fields). Biotechnology is being used to engineer and adapt organisms especially microorganisms in an effort to find sustainable ways to clean up contaminated environments. The elimination of a wide range of pollutants and wastes from the environment is an absolute requirement to promote a sustainable development of our society with low environmental impact. Biological processes play a major role in the removal of contaminants and biotechnology is taking advantage of the astonishing catabolic versatility of microorganisms to degrade/convert such compounds. New methodological breakthroughs in sequencing, genomics, proteomics, bioinformatics and imaging are producing vast amounts of information. In the field of Environmental Microbiology, genome-based global studies open a new era providing unprecedented in silico views of metabolic and regulatory networks, as well as clues to the evolution of degradation pathways and to the molecular adaptation strategies to changing environmental conditions. Functional genomic and metagenomic approaches are increasing our understanding of the relative importance of different pathways and regulatory networks to carbon flux in particular environments and for particular compounds and they will certainly accelerate the development of bioremediation technologies and biotransformation processes. Marine environments are especially vulnerable since oil spills of coastal regions and the open sea are poorly containable and mitigation is difficult. In addition to pollution through human activities, millions of tons of petroleum enter the marine environment every year from natural seepages. Despite its toxicity, a considerable fraction of petroleum oil entering marine systems is eliminated by the hydrocarbon-degrading activities of microbial communities, in particular by a remarkable recently discovered group of specialists, the so-called hydrocarbonoclastic bacteria (HCCB). In 1988, after prompting from the United States Congress, the National Institute of General Medical Sciences (National Institutes of Health ) instituted a funding mechanism for biotechnology training. Universities nationwide compete for these funds to establish Biotechnology Training Programs (BTPs). Each successful application is generally funded for five years then must be competitively renewed. Graduate students in turn compete for acceptance into a BTP. If accepted, stipend, tuition and health insurance support is provided for two or three years during the course of their PhD thesis work. Nineteen institutions offer NIGMS supported BTPs. Biotechnology training is also offered at the undergraduate level and in community colleges.
" The Convention on Biological Diversity (Article 2. Use of Terms)." United Nations. 1992. Retrieved on February 6, 2008.
" Diamond v. Chakrabarty, 447 U.S. 303 (1980). No. 79-139." United States Supreme Court. June 16, 1980. Retrieved on May 4, 2007. Gerstein, M. " Bioinformatics Introduction." Yale University. Retrieved on May 8, 2007. U.S. Department of Energy Human Genome Program, supra note 6. W. Bains, Genetic Engineering For Almost Everybody: What Does It Do? What Will It Do? (London: Penguin Books, 1987), 99. IDF 2003; "Diabetes Atlas,: 2nd ed. "; International Diabetes Federation, Brussels. IDF March 2005; "Position Statement." International Diabetes Federation, Brussels. U.S. Department of State International Information Programs, “Frequently Asked Questions About Biotechnology”, USIS Online; available from http://usinfo.state.gov/ei/economic_issues/biotechnology/biotech_faq.html, accessed 13 Sept 2007. Cf. C. Feldbaum, “Some History Should Be Repeated”, 295 Science, 8 February 2002, 975. The National Action Plan on Breast Cancer and U.S. National Institutes of Health-Department of Energy Working Group on the Ethical, Legal and Social Implications (ELSI) have issued several recommendations to prevent workplace and insurance discrimination. The highlights of these recommendations, which may be taken into account in developing legislation to prevent genetic discrimination, may be found at http://www.ornl.gov/hgmis/ elsi/legislat.html. S. Abdulla. “Drought Stress” Nature: Science Update; available from http://www.nature.com/ nsu; accessed 3 May 2002. Oliver, Richard W. The Coming Biotech Age. ISBN 0-07-135020-9. Agricultural Biotechnology: An Economic Perspective by the USDA Economic Research Service. A 1994 publication from the Agricultural Economic Report.